Microbial deterioration can damage both water- and solvent-borne paint formulations. Environmental regulations restrict the use of biocides. Sonication is an environmental-friendly, effective method of paint preservation. Power ultrasound allows even for the recycling of microbially spoilt paints and coatings. Paint preservation involves preventing the growth of bacteria, and other micro-organisms. Generally, biocides are added to the paint formulation in order to kill the microbes. With increasing demand for sustainable, non-toxic, environmental-friendly paints, nowadays paint formulations are produces with lower VOCs levels and often have a higher water content. As a drawback, these sustainable formulations are significantly more susceptible for microbial spoilage and deterioration. Power ultrasound is a green preservation method for paints and coatings. The effective cell destruction and lysis of the microbes helps to produce paints with low VOC and biocide content – though with a long shelf-life and good product stability. Water- and solvent-borne paints are used for their decorative and protective features. Especially water-borne systems are susceptible to microbial biodeterioration. Since environmental regulations become permanently stricter, the amount of biocides in paints must be reduced, since these biocides can be harmful for the environment and human health. Therefore, environmental regulations have limited the use of biocides substantially. Biocides are used to prevent and reduce the microbial spoilage of paints and coatings. They allow for a significantly longer shelf-life and storage capability of of the paint product. Due to the reduced use of biocides, an alternative method of preservation is required. Power ultrasound is a well-known technique of cell disruption and preservation and has been shown to reduce / replace the use of harsh antimicrobial chemicals. The microbial stability of paints is an important quality feature since any such growth in the canned product is known to deteriorate its functional usage. Power ultrasound helps you to improve the microbial and kinetic stability of your paint formulation! If paints have already turned bad due to insufficient preservation, sonication gives you the possibility to recycle paints and coatings in the wet-state. When paints and coatings have exceeded their shelf-life, the formulation can be refurbished by sonication. The formulation’s instability and spoilage can be reversed: Intense sonication disrupts the microbes, preserves and stabilizes the formulation so that the paint turns back into a salable product. The recycled product can be fed into the formulation stream and be canned for sale, again. This simple process gives you the ability to recycle deteriorated paint formulations preventing economic losses due to spoilage (including the waste disposal costs). Get a homogeneous and stable paint formulation with power ultrasound! Hielscher’s industrial ultrasonic devices can be easily installed and retro-fitted into existing production facilities. For high throughputs, our robust ultrasonic units are mostly used as inline systems. The paint formulation can be fed either through a one-pass or a recirculation setup. The number of passes through the cavitational hot-spot in the ultrasonic reactor can be adapted to the product and the specific requirements. 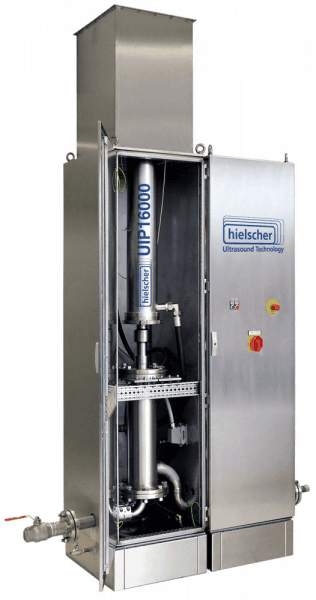 Hielscher’s ultrasonic systems such as the UIP2000hdT, UIP4000, UIP10000 or UIP16000 can be clustered so that there is virtually no limit in production capacity. All sonicators are built to run 24/7 and need very little maintenance. The reactor chambers are easy to clean due to a simple geometry and the ultrasonic cleaner which is in place (CIP). Downey, A. (2012): The use of biocides in paint preservation. In: H.W. Rossmoore: Handbook of Biocide and Preservative Use. Springer Sci 2012. Ishfaq, S.; Ali, N., Tauseef, I., Khan Khattak, M.N. ; Khan Shinwari, Z.; Ali; I.M. (2015): Analysis of paint degradation by fungal and bacterial species. Pak. J. of Bot., 47/2, 2015. 753-760. Obidi, O.F. ; Aboaba, O.O. ; Makanjuola, M.S. ; Nwachukwu, S.C.U. (2009): Microbial evaluation and deterioration of paints and paint-products. J. Environ. Biol. 30(5), 835-840 (2009). Ravikumar, H.R. ; Rao, S.S.; Karigar, C.S. (2012): Biodegradation of paints: a current status. Indian J. Sci. Technol. 5/1, 2012. 1977-1987. Wetting: The dry pigment powder must be wetted. During the wetting, the surface of the pigment particles and agglomerates are coated with the liquid. Deagglomeration / Separation: Aggregates and agglomerates must be broken, so that the surface of each individual particle is covered with the liquid. Power ultrasound is a very effective tool to mill, disperse and deagglomerate particles into a homogeneous formulation. Furthermore, sonication promotes the degassing of the formulation. Stabilization: The formulation is stabilized to maintain the particle size. An effective milling and dispersing method asstists a stable particle size distribution ans the stabilization during the storage. Gram-negative organisms that are commonly found in contaminated waterborne paint include Pseudomonas sp., Enterobacter sp., Proteus sp., Micrococcus sp. and Aerobacter sp. Gram-positive organisms of the Bacillus sp. may also be found in contaminated paint. The most common fungal species found on contaminated dry paint film are Aureobasidium, Alternaria, Aspergillus, Cladosporium and Penicillium. With increasing demand for sustainable, non-toxic, environmental-friendly paints, paints are formulated with lower VOCs levels and often have a higher water content. Less toxic, environmentally acceptable paints tend to have a less persistent shelf-life and show increased incidences of microbial infection. Microbiological spoilage of aqueous based surface coatings can result in severe economic loss to the manufacturer. The effects of bacterial and fungal activity are viscosity loss, gassing, malodour and visible degradation. In addition, discolouration caused by microbially produced enzymes can lead to changes in the product long after the formulation process. Viscosity loss of the paint formulation can be often observed as a result of the breakdown of cellulosic thickening agents. Waterborne and solventborne paints are used e.g. on exterior or interior walls of residential complexes. Those paints have two basic functions: protection and decoration. Microbial contamination in the wet-state paint and on dried films can destroy these functions, which results in degradation, malfunctions and optical / aesthetical deficits. Paint preservatives are a chemical option to prevent or contain microbial spoilage to a low degree. Common in-can preservatives (biocides / fungicides / microbicides) for paints and coatings include O-formals, N-formals, 5-chloro-N-methylisothiazolin-3-one (CIT), benzisothiazoline (BIT) and chloroallyl-3,5,7-azoniaadamantane chloride (adamantine). For environmental and health reasons, it is favorable to reduce or avoid the use of these chemicals. Power ultrasound is a green alternative that can replace the use of biocides or reduce the amount of biocides required to preserve the wet-state paint.